This is a really nice detail part that just arrived. 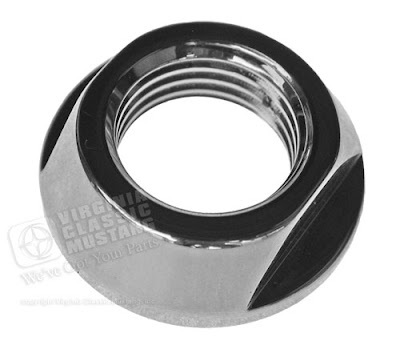 It is the correct "jamb" nut for the 68-69 Four Speed Shift Knob on the Mustang. It is the correct size and shape and features a beautiful chrome finish. Of course, we also have the shift knob itself. It is part number IN726. 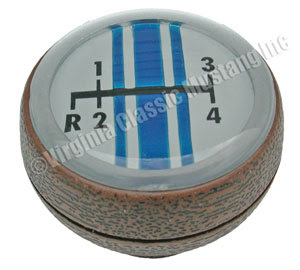 I have a '67 coupe with the fake walnut w/blue stripe shift knob, however, it is just a 3spd. I've got documented history on the car, and am sure this is the original knob. Mine has some cracks in the top plastic, and I would like to replace it, but I can't find one labeled for a 3 spd. Any help out there? Sorry, but we are not aware of a reproduction available for the 3 spd. We just have the standard black knobs. Thanks for reading our Blog!